If you’ve ever had to wait for a bus in London, there’s a good chance you’ve used a TfL live bus arrivals ticker. If you haven’t, all you need to know is that it’s a rather long LCD screen that shows live arrival times for the next two buses at the bus stop. This is possible due to every bus in London being outfitted with a GPS module, allowing them to be tracked in realtime and enable arrival predictions. 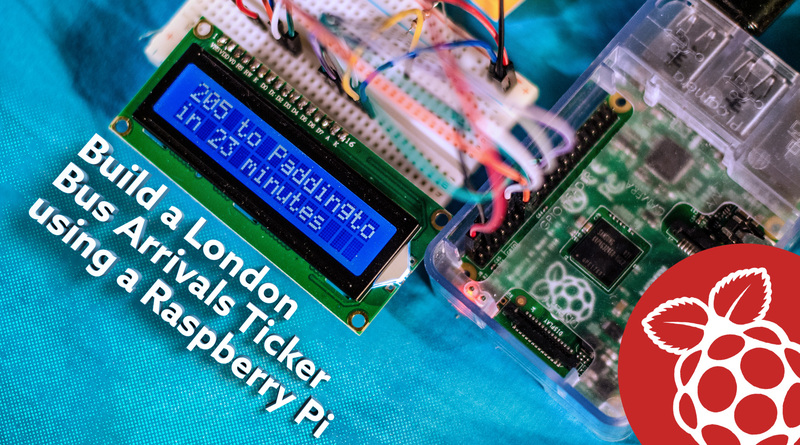 In today’s tutorial, we’ll be recreating the live bus arrivals ticker using a Raspberry Pi and a cheap Hitachi 16×2 LCD character display. There’s a variety of cheap LCD modules available on the market which you could buy. The cheapest ones are available on Amazon, but do not come with pins soldered. In that case you’d need a soldering iron to solder a header. Surprisingly, simply press pushing a header into the LCD doesn’t work, as the contacts seem to be on the top of the circuit board, as opposed to inside the holes. If you’d prefer a pre-soldered LCD, you can get one from Pimoroni. If you happen to own Adafruit’s I2C LCD modules (which also do require soldering), the wiring will be a lot less simpler and use a slightly different version of the code (more details below). Refer to this page for I2C wiring. 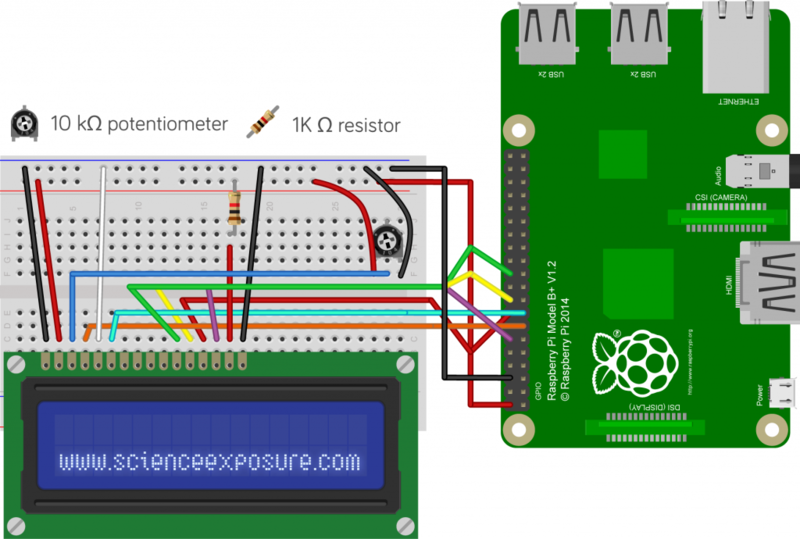 Apart from a soldered LCD module and a Raspberry Pi, you’ll need a 1K Ω resistor at minimum and a potentiometer. The resistor is important as some LCD modules don’t have a resistor for the backlight and hence, the current could increase to levels that are damaging to your Pi. Adafruit LCD modules always have a resistor, so that can be omitted in those cases. Finally, the potentiometer simply serves as contrast control. An earlier version of this diagram incorrectly displayed wiring for the black GND wire to the RPi and lacked wiring for the potentiometer! Woops! The code for this project relies on two important modules. The first is a custom module I’ve written which allows us to parse information from the TfL API. In brief, it pings the TfL servers for a JSON file containing the buses arriving at the specified bus stop. It then creates an array of bus lines, arrival times, and destinations, and sorts them according to arrival times. 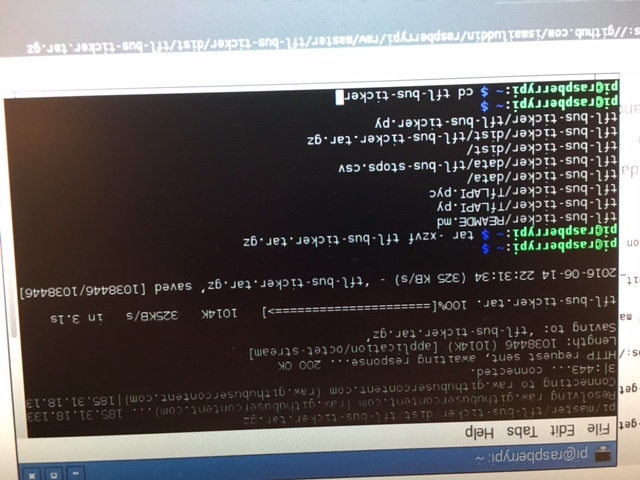 To run the script, simply type sudo python ldn-bus-ticker.py N where N is the bus stop code for your bus stop. This bus stop code number is the unique number found at every London bus stop, which you text to 87287 to get live bus arrival times. Alternatively, if you’re using an I2C LCD module, type sudo python ldn-bus-ticker.py N i2c. 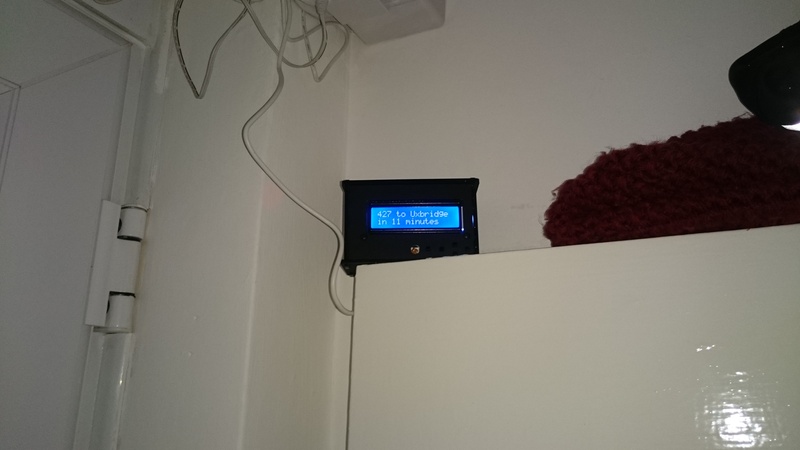 And voilà, you’re very own London bus ticker is set up in your house, keeping you up to date on your favourite bus stop. You can find other bus stop codes to try from TfL’s website. I hope you enjoyed this fun tutorial! If you have any suggestions or problems, drop a line below in the comments! Hello, I’m getting an errno2 no such file or directory when running the sudo python tfl-bus-ticker.py N have followed your instructions exactly, any ideas? Did all the previous commands run successfully, ie the wget… tar… cd..? 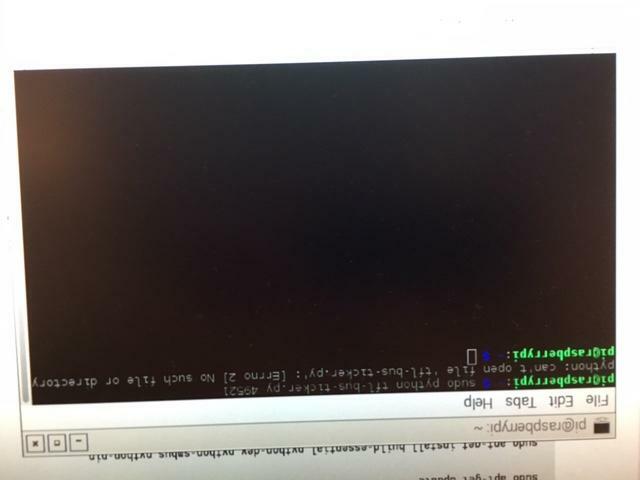 Hence, after trying cd but before sudo python… If you just type ls, do you see a list of the all the files? Hmm.. This project isn’t intended to be hard, so I wouldn’t say it’s too advanced. I tried to keep it as a simple as possible. The error you are getting is quite weird, so I’ll need to to troubleshoot it a bit to see what’s going on. It might just be a problem with my GitHub repo… :S Thanks for sending the screenshots btw, I’ll hopefully the solution soon enough! Hi Ismail, thank you for looking into it, code works great now! Do you have any advice if i wanted to display the info on a webpage? Am thinking of making a smart mirror and wondered if a larger screen would work better. Thanks again, much appreciated. Thanks for the speedy response and helpful advice, I’ll take a look. Thank you. Great project! I got it working in no time, I have even managed to modify slightly your code for my needs, but I cannot figure it out how to utilise the Adafruit I2C LCD module’s buttons so I could flick between 2 different stops, i.e. Up for Eastbound Services Down for Westbound Services. That’s a nice idea to improve on this project! Do you mind sharing the code, and I could help you modify it to get it to work for this purpose? 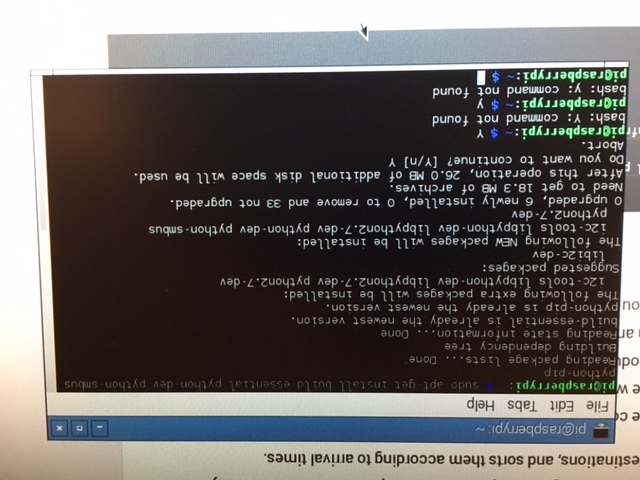 I am a complete Python noob and would not have any idea on how to correctly implement it. I was also reading up on a waiting loop, so the script once ran would monitor if the button gets pressed and change the bus stop, again I have not got the slightest clue on how to do it. and refer to the two different bus stop codes for the buses moving in opposite directions. Not a problem at all, it your time mate, which you have just devoted on some complete Python idiot! The script starts as normal with 2 arguments for 2 different bus stops, but then it goes into a loop similar to what my one did. Pressing the buttons does nothing… I have tried different buttons, just in case my soldering was not top notch (still much better than my Python skills), and ended up adding a different bus stop for every single button, but it still did not change the bus stops on press. When I however run the simple script posted above it seems to be reflecting the button presses and displays the relevant text. I will try to debug it later on and get back to you. © 2017, Science Exposure. Site designed by Ismail Uddin.